View my other patterns HERE. Finished Chest Measurement: 20(22,24) inches. Finished Blanket Measurement: Approx. 29"x29"
Materials: Sport weight yarn – 7(7, 8) oz. ; size 4(U.S.) and 6(U.S.) knitting needles, three ½-inch buttons; ¾-inch elastic. Repeat row 1 nine more times. For Newborn (0-3 months), follow Graph 1 till piece measures 11 inches. Bind off all but last 15 sts. On these last 15 sts, work seed st for 5 rows. Bind off. For 3-6 months, follow Graph 2 till piece measures 12 ¼ inches. Bind off all but last 17 sts. On these 17 sts, work seed stitch for 5 rows. Bind off. For 6-12 months, follow Graph 3 till piece measures 13 ½ inches. Bind off all but last 17 sts. On these 17 sts, work seed stitch for 5 rows. Bind off. Work same as sweater back, until piece measures 9 ½(10 ¾, 12) inches. Bind off center 9(11, 11) sts. Right front neck: Keeping in pattern, dec 1 st at neck edge every row 3(4, 4) times, then every other row 3 times. Work even in pattern till piece measures same as back. Left Front neck: Work same as right front neck, reversing shaping, EXCEPT work to the top in seed st, and AT THE SAME TIME, make buttonholes 3 rows before ending, as follows on right side. Seed st across 5(7, 7) sts, yo, work two sts tog, seed st over 4 sts, yo, work two sts tog, seed st to end. Bind off. With larger needles, cast on 21(23,27) sts. 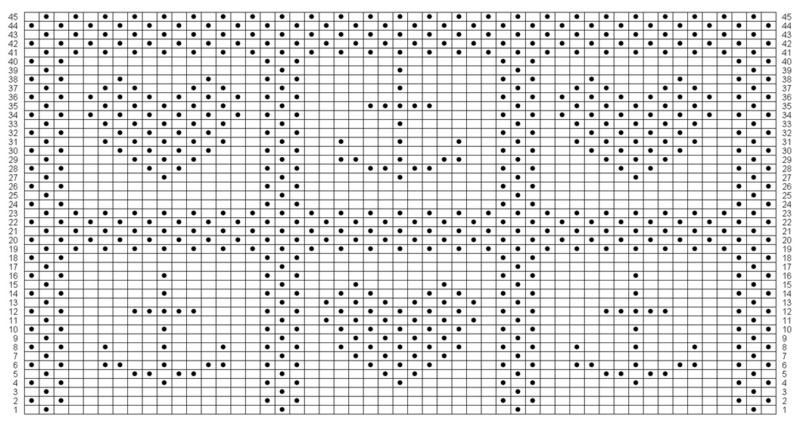 Work in seed stitch for 8 rows. Knit ino the front and back of each st on next row. 42(46,54) sts. Begin stockinette st, inc 1 st evenly along next row. Work even in stockinette stitch until sleeve measures 6(6 ½, 7) inches. Bind off. With smaller needles, pick up 55(61, 65) sts along neck opening, starting at top of left front neck. Work 6 rows of 1x1 rib, making buttonhole 3 sts from edge on 2nd row of neckband at left front. Sew top of left front to back left shoulder extension. Sew sleeves to sweater. Sew sleeve and side seams, leaving open along the seed stitch band at bottom of sweater, if desired. Sew buttons under buttonholes. With smaller needles, cast on 33(37,43) sts. Work in 1x1 rib for 1 ½ inches. Row 1: k 0(1,4),(k1, m1) across to last st, k1(2,5). 65(73,77) sts. Row 2: p23(27,29) place a marker, work row 2 of graph 4, place a marker, p23(27,29). Row 3: k23(27,29), slip marker, work row 3 of graph 4, slip marker, k23(27,29). Continue even, working edges in stockinette sts, and working graph between markers, until piece measures 7(8, 8 ¾ ) inches from beginning. Keeping in set pattern, bind of 3 sts at beg of next two rows, then dec 1 st each side on every right side row until there are 53(57,61) sts left on needle. Work even until piece measures 6 ¼ (7,8) inches above bound off sts. Change to smaller needles, and work in ribbing for 1 ½ inches. Bind off loosely with larger needle. Sew center front and center back seams. Sew leg seams. Trim elastic to desired waist measurement and sew ends together. Fold waistband in half over elastic and sew in place. Row 1: k9 sts, pm, k1, pm, k9 sts. Row 2: k1, inc 1, knit to 1 st before marker, inc1, sm, k1, sm, inc 1 in next st, knit to last 2 sts, inc1, k1. Repeat row 2 four times. 39 sts. Divide for instep: k24, turn. Row 1: sl 1, purl 7 sts, p2 tog. Turn. Row 2: sl 1, knit 7 sts, k2tog-b, turn. Work seed st for 6 rows. Bind off in pattern. Finishing: Sew back seam and sole seam. With larger needles, cast on 147 sts. Blank squares are knit sts on the right side of fabric, and purl sts on wrong side of fabric. Row 1 of graph is read from right to left, and row 2 of graph is read from left to right, etc.